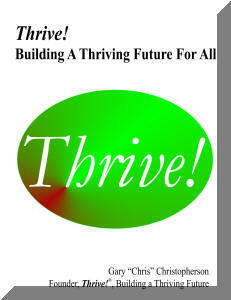 For people who want to join with Thrive!, take action and help build a thriving future, Thrive! - Building a Thriving Future for All is the "manual for positive change". It is available in paperback from Amazon.com or as a free download here. Thrive! was written and donated by Gary "Chris" Christopherson, Founder of Thrive! and viaFuture. Thrive! supports those wanting to create and sustain positive change and a thriving future for all forever. As we look around us in America and the world, much of what is important to us is already broken or endangered, much of it unnecessarily so. Because it is people who have broken much of the world and endangered its future, it is people that can and must fix what is broken and build a survivable and thriving future for all forever. This is our moral imperative. People’s behavior is the key to creating and sustaining large, positive, and timely change for a thriving future. People’s behavior is what most endangers our future. People’s behavior is also what offers the best chance to change and build a thriving future. But for transformation and the behavior that brings about that change to occur, people must be motivated and able. Thrive! is the motivating call for action by our leaders, all of us together, and each of us. viaFuture provides “next generation” strategy and the enabling framework for creating that large, positive, and timely change. While helpful to issues (e.g., health) and subpopulations (e.g., the vulnerable), the framework and strategy are especially helpful for whole communities (including non-geographic populations, towns, cities, counties, states, regions, nations and the whole world). Four examples demonstrate their use: HealthePeople - Building a Healthy and Thriving Future, Vulnerable - Vulnerable in America and World (via), Building and Sustaining a Thriving Community, and Building and Sustaining a Thriving Future, the most comprehensive approach. A new example, Thrive! Systems, is added in this version of the book to demonstrate how this has and can be used to improve thriving for persons and their community.